While politicians talk of returning to the moon to build bases of operation, marine scientists continue to discover bizarre aliens right here at home in the inky black depths of the sea - a world with as many mysteries as that of the cosmos. 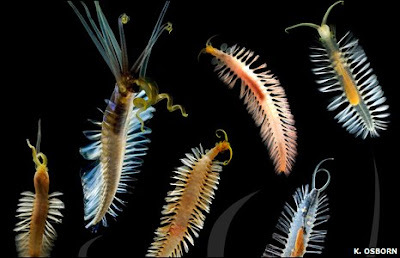 Case in point: Dr. Karen Osborn of Scripps Institution of Oceanography, along with colleagues from the Monterey bay Aquarium Research Institute, recently found a new species of deep sea worm while using a remotely operated submersible (ROV) off the California coast. At a depth of over 8,800 feet, a new member of Swima worms was filmed and several specimens were taken for study topside. Very strange little critters who can swim through the water with the continuous, undulating beating of long bristles that run the length of their bodies. The worms have the ability to bioluminate but also have a darkened gut so as to hide the bioluminesence of their consumed prey. Therefore, they know when to turn on the lights and when to hide in the dark to avoid attracting unwelcome predators. 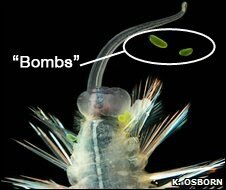 However, should they find themselves threatened, these worms are also able to release small bioluminescent "bombs" in the water to distract predators while they make a hasty getaway. The bombs are small appendages attached near the worm's head. The worms are nicknamed "bomber worms" because of this unusual ability. The bombs are only 1-2 millimeters in length, making them difficult to see with the ROV's cameras. But once brought to the surface, this clever evasive maneuver became clear to the researchers. "So we bring the animals up to study them," Dr Osborn said. "If you transfer the animal into a small tank, and harass it a little bit with forceps - kind of bump it anywhere on the body - it will release one of these bombs. As soon as [the bomb] is released it starts glowing green and the animal swims away." Having grown up with the space program and seen the scientific gains in knowledge and the ancillary material benefits in technology combined with the thrill and awe of discovery, I must admit a certain sense of childhood excitement at the prospect of returning to the moon. But exploring the depths of the oceans right here on Earth can fulfill many of those same goals and aspirations, with the added benefit of learning more about the planet's largest environment - an ecosystem that needs to be better understood in all its complexity if we expect to help preserve and protect it. Observed Dr. Osborn, "This group of really fantastic animals emphasizes just how much we have to learn about deep sea organisms and deep sea biodiversity."